Sometimes we sound like a broken record, repeating the same advice to anyone who will listen. But some things are worth hearing over and over. “Microchip your cat” is one of those topics we just can’t talk about enough. Every April, I think about our patient named April, who was happily reunited with her owner because of her microchip. So even though we’ve posted her story (and other stories about microchips: Check the Chip Day, Microchip Your Cat) before, we thought it’s a good time to remind everyone to microchip your cat if you haven’t already done so. And see below, for an update on April (pictured above, enjoying her A Cat Clinic catnip bag) and her kittens (Frederik is pictured below, as a kitten and then all grown up!). Originally posted on July 22, 2014 Think Your Indoor Cat Doesn’t Need a Microchip? Think again! “My cat never goes outside, so s/he doesn’t need a microchip”. April’s story has a happier ending, although she, too, gave her family quite a scare. April was abandoned here at the clinic and delivered a litter of 3 kittens days later. We of course took her in, and enjoyed watching the babies grow. 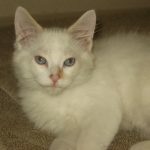 Our client, Linda, had recently lost one of her cats and decided to adopt April, so when the kittens were old enough to be placed in homes, Linda took April home. When we spayed April, we placed a microchip. Unfortunately, April hated carriers, so when April was due for booster vaccinations, Linda was using a figure 8-harness and leash. Usually this works, but April was able to slip out of the harness in the clinic parking lot, into the woods. Linda kept coming back and calling, bringing food, without success. 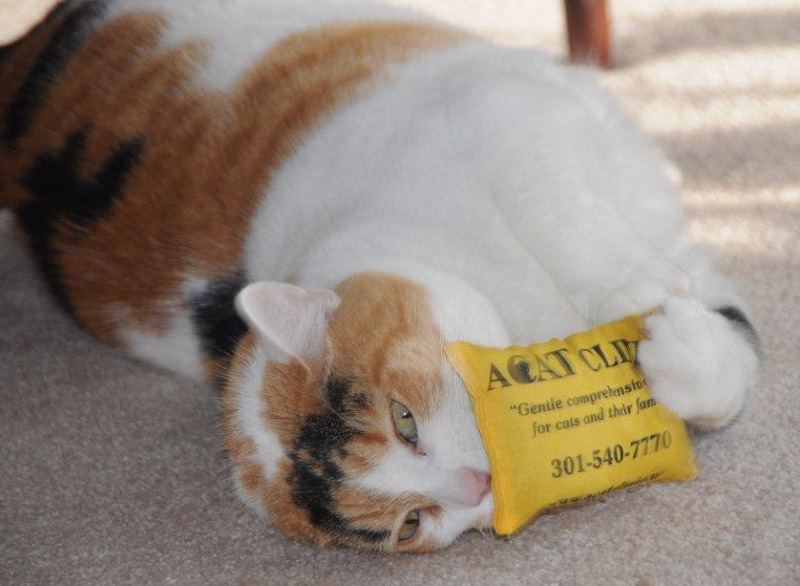 At our clinic, between Boyds and Germantown, MD and bordering a large wooded area, there are LOTS of places for a cat to hide! Until one day about 6 weeks later, when one of our astute receptionists, Grace, spied a cat that looked like April across the street and called Linda. Linda came over, was able to corner April in someone’s garage. To the surprised homeowner, she explained the situation, went home to get a carrier and came back to get April. When Linda brought the cat to the clinic, we were able to scan for a microchip and confirm that the she was indeed April! So, you may have an indoor cat – until something happens. For the unexpected, having your cat microchipped makes sense. The statistics are alarming: without a microchip, only about 3% of cats are reunited with their owners. With microchips, the statistic is more than 25% – significantly better. When to place a microchip? 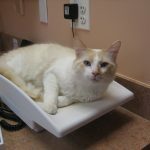 Our preference is to place the microchip when your cat is asleep (during dental procedure, spay or neuter). But, it can be placed during an office visit and most cats tolerate well. A central registry allows any hospital or shelter to contact the company, get the contact information you’ve provided so they can reunite you and your cat. Scanners are much more universal now, and the first thing done by any shelter or someone bringing in a stray cat is to scan for a microchip. April is now 12 years old, and still lives happily with Linda and her family. One of her kittens was adopted by one of our employees at the time, who since went on to veterinary school. Two of her other kittens, Hans and Frederik, are still patients and are now 10 years old. They are all beautiful, healthy kitties whose story does indeed have a happy ending!